The individual who left the country for more than 6 months, or the resident who has an expired residence and his ID is also expired after his departure; while the fine on expired card is payable if the individual didn’t get an ID card or his ID is expired before departure. The fine must be paid for the period of arrival date or the date of expiration until the departure date. The individual whose his card is expired after his deportation under a deportation order, administrative decision or judicial ruling by the respective authorities; while the fine must be paid if the individual didn't get an ID card before the departure. The fine must be for the period of arrival date or the date of deportation, but if the deportation was before this decision; then the individual will be exempted from all delay fines payable for non-issuance or renewal the card. The deceased or person with infectious disease, whether ID card was issued or not renewed for him during the period from death or proof of infectious disease. If the ID card is not originally issued; then the fine must be payable for the period from his arrival date to the country to the date of issuance a medical certificate of the infectious disease. The fine is also payable from the date of proved cure of the disease, whether it is for issuance or renewal of the card. The individual whose ID card hasn’t been issued for the period occurring before or after obtaining the passport, or before obtaining the family book. Any delay resulting from service error or a reason attributed to EIDA or printing offices mandated by EIDA leading to delay of registration and renewal of ID. The procedures cannot be completed in service centers for the customer who hasn’t a residence or whose residence permit expired. He shall visit the printing office and bring a printed application,informing the service center to insert his number in the system in order to exempt him from the fine. Communicate with the Customer within 24 hours from the date of submission of the application and supporting documents. 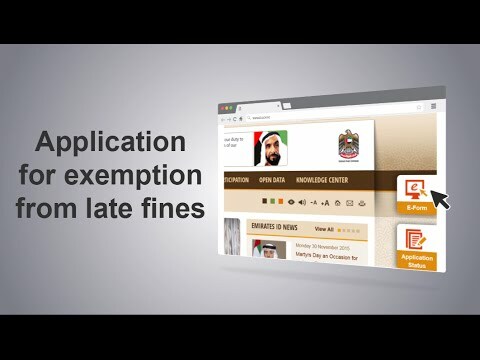 The service will be made available through service centers to submit the application and complete all procedures if the application has been approved. I was notified by EIDA that I have to pay a fine. I visited EIDA service center and I was notified that I am included in the categories of fine exemption. I submitted the exemption application and required supporting documents to the service center. EIDA customer service officer notified me of the exemptions committee approval on my application. I completed all renewal procedures in the service center. I have been asked to submit my feedback for my experience with EIDA. I provided my opinion through my preferred channel. Page last updated on : 28/12/2017 13:02:27 This site is best viewed in 1366x768 screen resolution. Supports Microsoft Internet Explorer 10.0+, Firefox 10.0+, Safari 3+, Google Chrome 12.0+ Copyright © 2017 Federal Authority For Identity and Citizenship. All rights reserved.